What you do with the upper component of the JMiles UH-TP267 Toilet Paper Holder with Magazine Caddy is pretty obvious: you slip on a roll of toilet paper, keeping that very necessary product close at hand beside the commode. What you use the lower rack for is more open to personal preference, though. 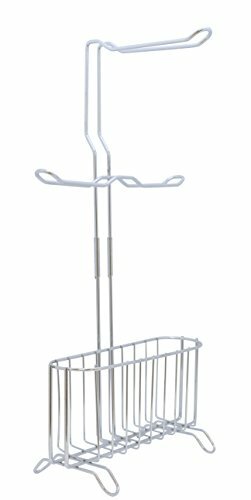 This chrome bathroom caddy's lower storage area is the perfect shape and size for accommodating a number of magazines, books, or the daily newspaper, but it can also be used for to store many other items. The rack can hold bottles of shampoo, conditioner, or soap, or it can be used to store cleaning products. You can even tuck a folded towel into the rack so you always have a spare dry towel at the ready. The JMiles UH-TP267 is narrow enough to slide between the toilet and the wall, sink, or the tub or shower, and the elevated toilet paper holder puts your bathroom tissue in easy reach. The unit's high shine chrome finish not only looks great, but it also resists rust and tarnish, a plus in a high moisture environment like the lavatory. If you have any questions about this product by J Miles Co., contact us by completing and submitting the form below. If you are looking for a specif part number, please include it with your message.